Thru-hikers are in luck. The January to March hiking season is the coldest part of Florida's otherwise short and mild winter. The worst of the biting insects—deer flies and chiggers—are inactive and waiting for spring. We are strong advocates for using non-toxic, non-polluting products in the backcountry. You would never leave food wrappers or other trash on the trail, so you should not leave toxic chemicals behind either. We strongly discourage you from using products that contain DEET, which is toxic to both humans and the environment. It also stains nylon and polyester clothes and leaves an oily residue on skin and gear that is impossible to clean in the backcountry. Once on your hands, this residue ends up on your guidebook, maps, journal, toothbrush, water bottle, water filter, pots, utensils, et cetera, and we don’t want to eat DEET, right? Besides, there are alternatives that work just as good — or even better. The hard-to-find sunscreen Cactus Juice is the only thing we've found that keeps away sand gnats (see below). Nothing else works, including DEET. It is hard to find in stores, however. We couldn't even find it in the town of St. Mark's, which is plagued by sand gnats, so order it from the Cactus Juice website. The company makes multiple products — you want the "20 SPF Sun & Skin Outdoor Protectant Sunscreen." The Florida Trail stays away from the salt marshes and coastal areas where sand gnats live until reaching the St. Mark's National Wildlife Refuge, where you will be forever grateful you brought Cactus Juice. Include a bottle in your maildrop at JR's Aucilla River Store. There are many natural bug repellents on store shelves and lots of home recipes online, but after a long (and still ongoing) search, we have found two non-toxic, non-DEET alternatives that work to our satisfaction: EcoSmart Insect Repellent and All Terrain Herbal Armor. The products that failed to deliver were often made from combinations of lemon and eucalyptus oils. While these smell nice, the mosquitoes keep coming. We recommend avoiding the following: Natrapel, Cutter Lemon Eucalyptus, Repel Natural, OFF! Botanicals. The presence of so many mosquitoes at dusk makes it a good idea to carry an empty 32oz Gatorade bottle. If you need to pee, instead of unzipping the tent to face hordes of mosquitoes (and inevitably letting a few inside), just pee in the bottle. Gatorade bottles have wide mouths that make it easy and 32oz is a good size in case you need to go again later. Women can even do this if they use the pStyle. On a thru-hike, Florida’s best known insect nuisance isn't as bad as you think. From January to February there aren't many in natural areas. The Big Cypress swamp has hardly any at all. There are many species, but the most hated mosquito is probably the Asian tiger mosquito. Present year round, widespread, and an aggressive daytime feeder, the Asian tiger is a menace, but more so in urban and suburban areas. Since it breeds in small containers with standing water it's commonly found near homes and once hatched, doesn't wander far. For thru-hikers, mosquitoes are at their worst near artificial water bodies like ditches and canals. We've never seen larger swarms — anywhere, ever — than those along the levies through the Everglades Agricultural Area. The canals bordering the levies have no fish or other natural predators living in them, and so the mosquito population is huge. During that stretch (two days of hiking, max) we recommend stopping two hours before dusk to make dinner and set up camp. As soon as dusk begins, dive into your tent and stay there. A thick cloud of mosquitoes will soon cover the tent. Fortunately, once you are north of Lake Okeechobee the mosquito situation improves dramatically. Mosquito borne diseases have plagued Florida throughout its history post-1492. In the nineteenth century epidemics of yellow fever swept the state. Today we benefit enormously from government mosquito control programs, but diseases like West Nile virus, dengue fever, chikungunya, eastern equine encephalitis, and St. Louis encephalitis occasionally make headlines. You can read up on these diseases at the University of Florida mosquito info site, but you have a great chance of contracting one in Miami than in the backcountry, and we've concluded the overall risk to thru-hikers is low. Far worse than mosquitoes are sand gnats. Technically a biting midge, there are many species and many names for them such as sandflies or no see'ums. In the Big Bend and Panhandle of Florida the dominant name for them is "sand gnat." They swarm in coastal areas, especially in the mud near mangrove swamps and salt marshes. The stretch of Trail through St. Mark's NWR is prime habitat. The gnats are so small, they look like flecks of pepper and are hardly identifiable as flies when they land on you. Their bite however, is big. Gnats use teeth to make a small cut in the skin while at the same time spitting a chemical that prevents blood clotting. They then slurp up the blood that pools in the cut. The resulting welt is red, itchy, and does not heal for two weeks. Two weeks! They are mostly active around dawn and dusk but some biting occurs throughout the day, especially if it is overcast. The only thing that repels them is the sunscreen Cactus Juice (see above). It works miracles. Florida has five species of ticks that may bite you or your pet: the blacklegged tick (aka the deer tick, carrier of Lyme disease), American dog tick, gulf coast tick, brown dog tick, and the lone star tick. The most common and most likely to bite you is the lone star tick. 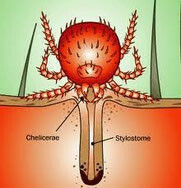 The lone star tick, Amblyomma americanum, is found throughout Florida and it feeds on humans during all three stages of its life (larva, nymph, adult). Bold and aggressive for a tick, we have watched many of them crawling across our tent looking for a way in, rather than passively waiting on the ends of grass until an animal to pass by like other ticks. Their saliva can be irritating so redness and itchiness at a bite site does not necessarily mean infection. The lone star tick does not transmit Lyme disease, however it does transmit the little-understood STARI illness (see below) with initial rash symptoms easily mistaken for Lyme disease. Usually, ticks are ambush hunters who climb vegetation and wait for an animal to walk by then leap on (except for the strangely determined lone star tick). When the Trail is overgrown or surrounded by tall grass, you are most susceptible to ticks. To prevent bites, wear long-sleeved shirts and long pants with your pant legs tucked into your gaiters so that ticks cannot crawl up your leg inside your pants. They like to go for the groin. Spray your pants with insect repellent at the ankles and waistband. Remove attached ticks with fine-tipped tweezers. Grasp the tick as close to the skin's surface as possible and pull straight back. Do not twist the tick, because its mouthparts may break off in your skin and can become infected. Be careful not to squeeze or crush the tick since the tick's bodily fluids may contain pathogens. No folk remedy actually works: suffocating the tick with Vaseline or nail polish, touching a hot knife to the tick, et cetera. According to the CDC, in 2014 there were just 85 confirmed cases of Lyme disease in Florida and 70 probable cases. By comparison, Pennsylvania had 6470 confirmed cases, Massachusetts 3646, and tiny Connecticut 1719. Florida's numbers are very low for a state with 19 million people, and at least some of those 85 cases originated outside Florida since the CDC data reflects where patients were diagnosed with Lyme, not where they contracted it. This information, combined with seasonally low tick activity during the winter thru-hiking months, and the fact that the lone star tick does not transmit Lyme, leads us to conclude the risk of Lyme disease on the Florida Trail is very small. If you aren't already familiar with Lyme disease, we recommend reading the CDC page about it. Inactive in winter, the following are a nuisance for section hikers outside the January-March window. There are two easily recognized biting flies: horse flies and deer flies. In many places, deer flies are called “yellow flies” but in Florida, there seems to be a distinction made between deer flies and yellow flies: most deer flies attack people and pets around the head, neck and shoulders. Yellow flies and horse flies usually attack the legs. All of these flies are a problem for hikers since their painful bites draw blood and often swell into itchy red sores. They are active from March to November, with a peak season from April through June. Although horse flies and deer flies attack throughout the day, they are most active during the late afternoon and on cloudy days. They are common near large bodies of water and within forests, and are seldom found in open prairies and scrub far from the shelter of trees. The flies are territorial and ambush hunters, lying in wait for something to walk through their territory. They are attracted to heat and motion. As you hike, you continually enter a new fly’s territory and attract new flies. Since the flies are attracted to heat and motion, there isn't much you can do to prevent getting bit except wearing long sleeves. Chemical insect repellents, even those with DEET, are not effective. Wearing light colors helps since dark clothing is hotter. At least one company sells a deer fly patch, a sticky rectangle of flypaper you attach to the top of a hat. However, we prefer a modified version of the “trolling deer fly trap” developed by the University of Florida. To make one, attach a coat hanger wire or rod to your pack that sticks up above your head, like an antenna. On top of this, place a blue plastic Solo cup upside down (the kind you used for keggers in college). Make sure that the cup is able to shake, rotate, and otherwise move. As you hike, the flies respond to the cup’s motion, color, size, and height. Since deer flies usually fly at heights lower than 10 feet and attack the highest available area on the human body, they attack the cup instead of you. In camp, hang the cup from a branch, making sure that it moves in the wind. 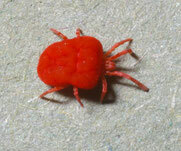 Trombiculid mites are also known as berry bugs, harvest mites, red bugs, and chiggers. Chiggers are the Florida backpacker’s biggest enemy on the trail. Why? Because they are so small, (1/100 of an inch) they are almost invisible. Hundreds of them can bite you without your knowledge. They leave behind painful, itchy, swollen, and red welts that do not heal for two weeks. This makes for miserable hiking. However, there are two reasons for optimism. First, trombiculid mites are most numerous in summer when vegetation is heaviest. 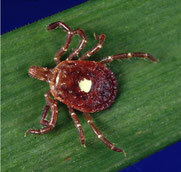 If you hike only during the prime hiking season of November–March, chiggers should be much less of a concern. Secondly, chiggers do not transmit disease. Chiggers feed on skin, not blood. They insert their mouthparts into hair follicles or pores then inject a salivary secretion containing digestive enzymes that dissolve skin tissue. They feed by sucking up the liquefied tissue. The digestive fluid also causes surrounding tissues to harden, forming a straw-like feeding tube of hardened flesh called a stylostome. Chigger bites itch and many people assume—incorrectly—that this is because they burrow into the skin. In fact, it is the stylostome that causes the itching. When they first attach to your skin, the bite goes unnoticed. Only 4-8 hours later does the itching begin, and by then the chigger itself has detached from your skin. When one bite appears on your skin, it is certain that more will follow. Chiggers seem to prefer parts of the body where clothing fits tightly and so bites appear most frequently beneath socks, underwear, bras, and along the waistline. The best method is to recognize chigger habitat and avoid exposure. They thrive in summer, in dry tall grasses and other low-lying, unshaded vegetation. There they wait on the tips of blades of grass, until a potential host walks by. Because they are found in grass, stay on the trail. To minimize the possibility that they will catch a ride as you walk past them, wear tightly woven long pants (i.e. nylon). Do not apply Deet-based repellent to shoes, pant legs, and skin, as this does little. Some sources recommend permethrin-based repellents, but this is a very toxic chemical and we discourage it. Do not wear dog or cat flea collars on your ankles or cattle ear tags on your shoes to ward off chiggers. This does not work, is toxic, and can cause chemical burns on your skin. If you suspect that you have chiggers attached to your skin, they are easily removed with soap and water. However, once a bite appears, it is too late to prevent more bites from appearing. The stylostomes, which are the irritant, remain after the chigger is gone. Time is the best and only healer of chigger bites. As a chigger bite heals, it looks like a pimple and can be popped. A small amount of puss will come out. To temporarily relieve itching hot showers helps for a few hours. The most effective relief comes from lotion containing aloe and lidocaine, which is marketed as sunburn relief. Folk remedies such as nail polish, calamine lotion, Vaseline, and baby oil do not work and are based on the false belief that the chigger is still embedded in the skin and needs to be suffocated.